There's really only one major difference between power strips and surge protectors. But when you're using either to power an expensive or essential device, that sole distinction matters more than you might think. Read on for the details. Not quite sure of the difference between power strips and surge protectors? You’re not alone. Home improvement centers report that many customers ask the same question. Perhaps it’s time to set the record straight? Power strips are basically extension cords with multiple receptacles. For most purposes, they work fine in supplying electricity to devices located near one another—so long as those devices are not expensive or essential for your daily routine. However, if you’re plugging in a laptop, modem, router or flat-screen TV, you may wish to opt for a surge protector. Because they provide a safeguard against power spikes, the latter makes the best choice for certain prized items. Note, many surge protectors look just like power strips, but you can always tell a surge protector by the specification stamped or printed on the housing (this indicates the level of protection the unit provides). 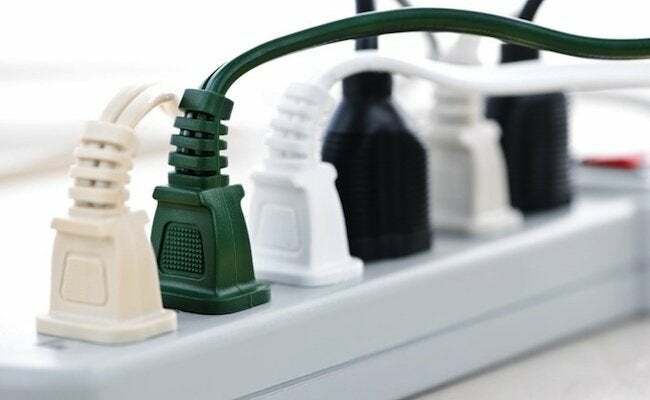 Some newer surge protectors can even help cut your utility bills by temporarily powering down devices not in use—a great option for accessories you don’t use all day, every day.